AmphiMentol (Amphi-SPEAR in some markets) is a unique combination of natural oils and spirits known to have a great effect on improving respiratory symptoms associated with Newcastle Disease, avian flu, and other viral and bacterial respiratory infections. The combination of Eucalyptus Oil, Menthol, Thymol, and Camphor Oil works in tandem as antiviral and antibacterial agents. AmphiMentol's (Amphi-SPEAR in some markets) mix of multiple active ingredients works in synergy to hinder the ability of pathogens to develop resistance. Amphimentol (Amphi-SPEAR in some markets) has ingredients that help loosen the mucus and get rid of phlegm and pulmonary irritation. Amphimentol (Amphi-SPEAR in some markets) can be added to drinking water or sprayed. 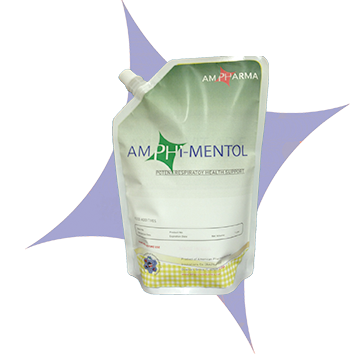 Amphimentol (Amphi-SPEAR in some markets) is a very safe natural product and can be given to all poultry and livestock. Amphimentol's (Amphi-SPEAR in some markets) highly concentrated mix of essential oils works as a potent multi-purpose flavoring agent, as it improves the taste of feed, and as a digestive agent, as well as improving the performance and health of poultry and animals. Amphimentol (Amphi-SPEAR in some markets) possess antioxidant action, stimulating natural defenses of animals. Amphimentol (Amphi-SPEAR in some markets) is an effective substitute for all growth-promoting antibiotics. Add to drinking water at the rate of 1 ml / 2 liter of drinking water. Add 1 ml of Amphimentol (Amphi-SPEAR in some markets) in 1 liter of drinking water twice daily for three days. Spray 200 ml of Amphimentol (Amphi-SPEAR in some markets) diluted in 1000 liter of water. Use fine nozzle twice weekly or as needed. Peppermint Oil, Eucalyptus Oil, Camphor Oil, Menthol Crystals, Saponin, Thymol, Carvacrol, Acetyl Cysteine and other proprietary micro ingredients, including RH 40 Cremophor, Propylene Glycol, BHT, Deionized Water and excipients.